Recently I was asked by the great people at Target to share a few of my favorites from their new RE line. The entire line is just what the name implies, a home's essentials. All the basics every modern room needs to begin building upon like thin line frames, solid colored bedding, unobtrusive storage and organizers. From there you can create your space to reflect your own style, mixing high/low, new/old and patterns/solids. 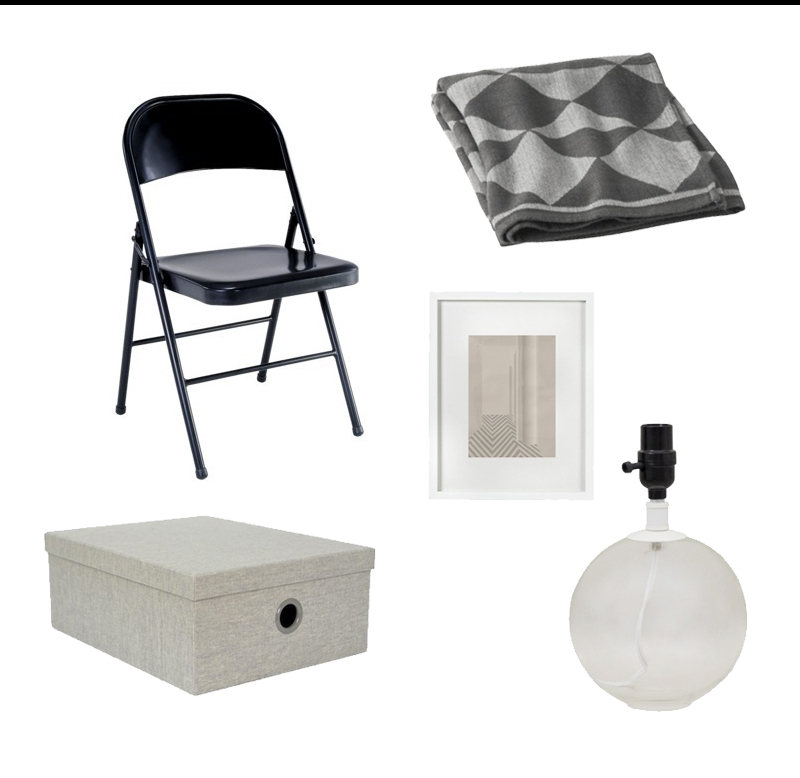 STEEL FOLDING CHAIR | It doesn't get more versatile or practical than a black metal folding chair, everyone has a reason to use one at some point (in a few weeks I'll show you my own take on the basic metal chair so stay tuned). A GEOMETRIC THROW | Grey goes with almost any decor but with a little pattern it's more interesting. WIDE MATTE FRAME | I never have enough frames for all the interesting pieces I find, or for my son's drawings. A thin white frame doesn't distract from what it's displaying, in this case a favorite from design group All the Way to Paris. GLASS ORB LAMP | Simple shapes like circles and rectangles are needed for every room. An orb shaped glass lamp lends itself to whatever you need it for. A linen shade in different colors or a silver dipped light bulb with no shade would work for me just fine. Set it on top of a stack of magazines or a small side table and the light will filter through it's opaque base. that glass oil lamp, that's really something i've never seen before. beautiful! Beautiful picks, particularly like the throw and the lamp!